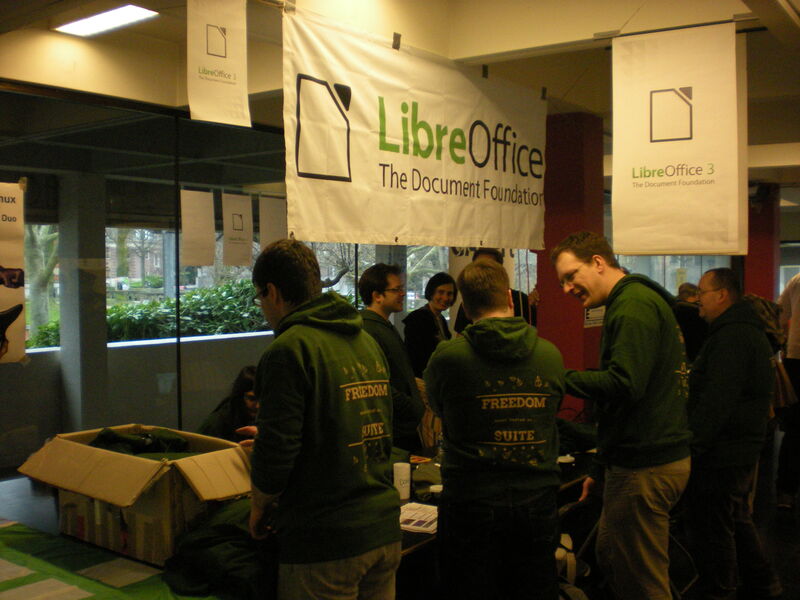 Thanks to private and corporate sponsors, and most of all because of so many enthusiastic volunteers, LibreOffice had a presence on this years FOSDEM and the CeBIT 2011 trade fair. 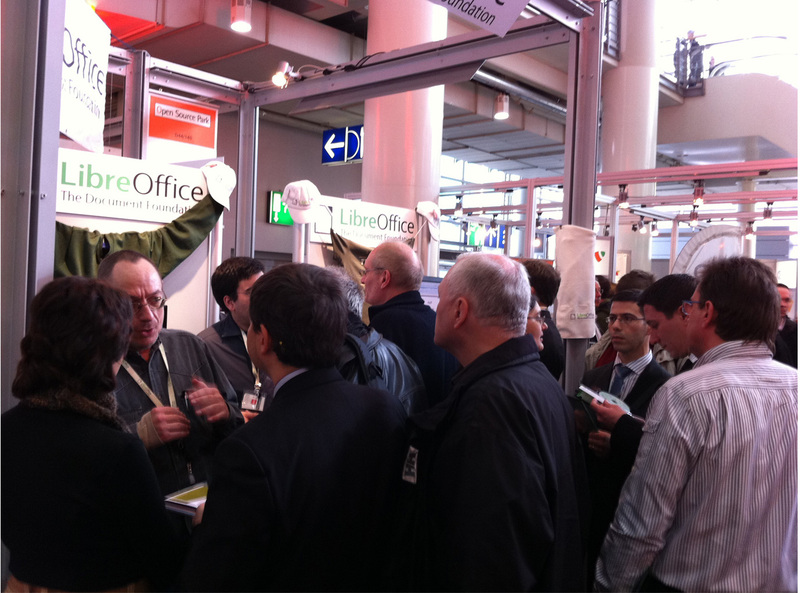 Although both events are almost diametrally different, in both audience and recommended attire, there was a common trait – the interest and support we received for LibreOffice was immense. 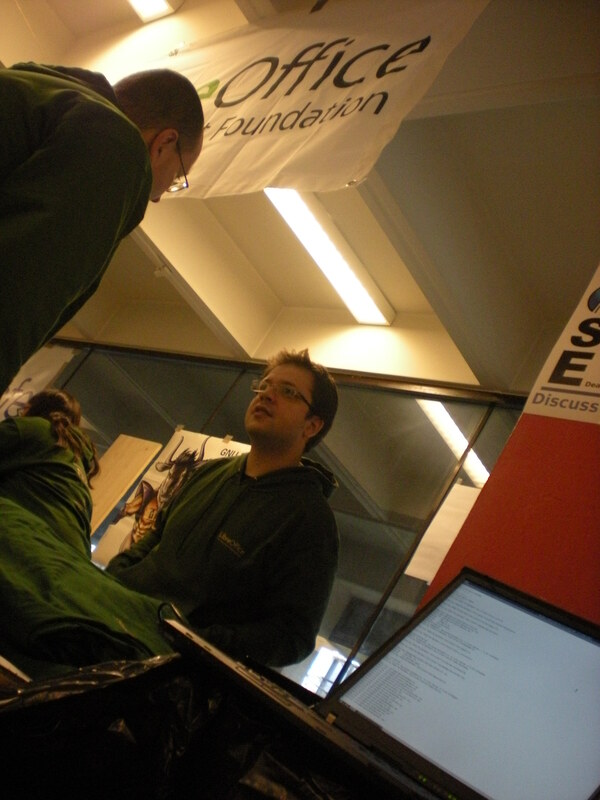 On FOSDEM, we had a table right between CACert and FSFE, in the entrance area of building H (one of the best places, I gather). Kendy and Bubli had brought boatloads of LibreOffice tshirts and jumpers from Prague, that we collectively lugged to the booth & almost fully sold over the weekend. Lots of people wearing green, suddenly. On Sunday, there was a LibreOffice devroom, among many others, with a talk from yours truly about Impress hacking. This year, I was able to spend two days at CeBIT, joining the booth team of Jacqueline, Karl-Heinz, Roland, Thomas and Ulrich. The booth location was nicely located at a corner, with Linux New Media and Firefox presences vis-a-vis – and was packed with people most of the time (amazingly, Roland was able to recruit new German association members on the spot, and even talked them into helping out at the booth). Met with a few press people, and tons of friends and colleagues from the new and the old project. Much encouraged to hear interest from larger and smaller sites to go & try LibreOffice (a handful of successful migrations have already happened), and from a few extra opensource companies planning to start hacking LibreOffice core code. Managed to miss ICE train back to Hamburg in the evening, due to a friendly “train is 15 minutes late” vanishing literally seconds before the train arrived in the station (much earlier than 15 mins late). The second day was maybe even more crowded, and from the talks I had, slightly more end-user-focused. 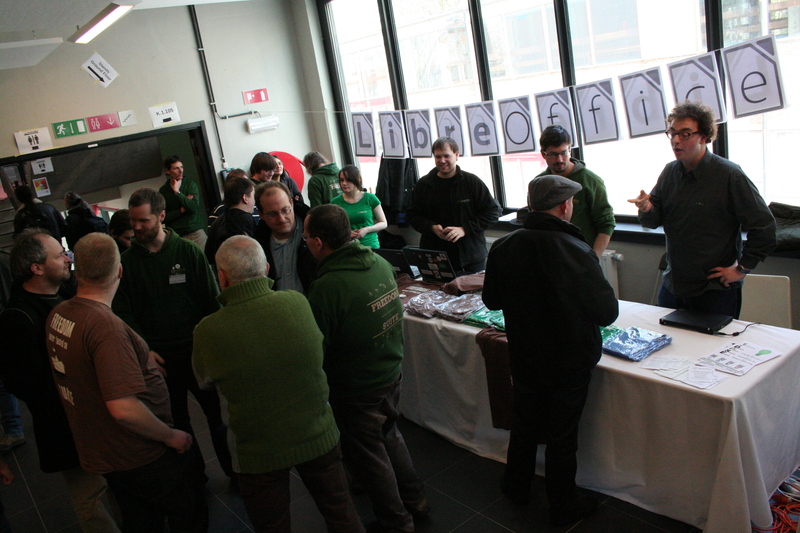 People were generally very receptive to my “everyone can contribute something to LibreOffice” line. One case in point was a computer science prof, asking for a feature and not aware of the fact that he probably has more readily available talent with spare time at his disposal (i.e. students), than most of the LibreOffice project members. Besides that, got offers for more tinderboxes, and a few really high-quality bug reports. At the end of the second day, the donation jar turns out to be quite full, and so the question comes up “how much is in there?”. Ensuing is a little bet – the closest estimate wins a cheese sandwich, specially-crafted by Jacqueline. Results not yet in. Many thanks to all involved into making that a success – both events were wonderful debuts!